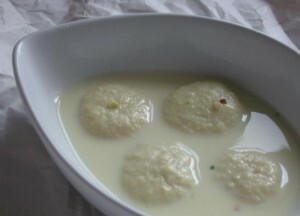 Mix all the ingredients except milk, sugar and cardamoms and make a dough, now make small balls(20-25). Put the milk, sugar and illaeechi for boiling, boil it for 15 mints. Now put the balls in it and keep regutating the flame from high to low for 2-3 times until the balls become double the size. Serve it cool with almond flakes on it.